My first post, it's kind of exciting. Aside from last week's snow blip, we should be warming up. The sunshine today certainly is welcome. 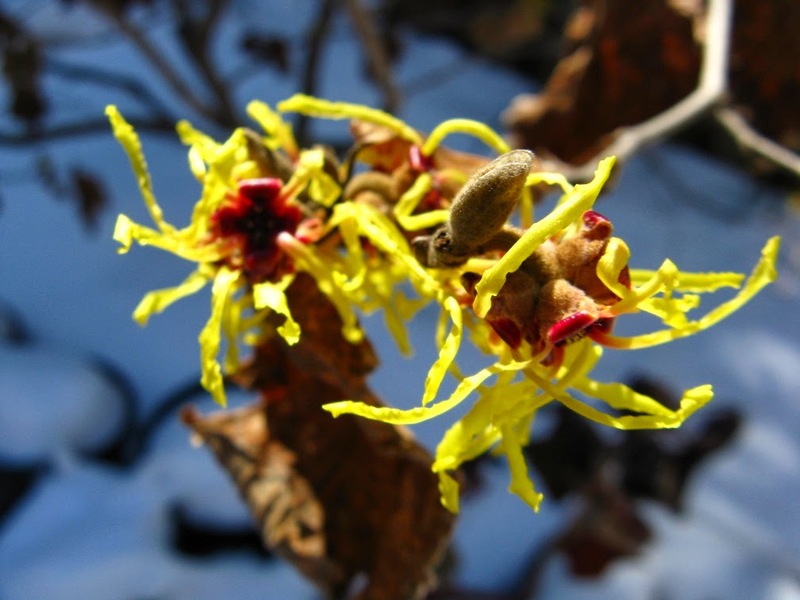 The 'Arnold Promise' witch hazel (Hamamelis x intermedia 'Arnold Promise') in the backyard blooms so reliably every March that it is, to me, the true harbinger of warmer days. Besides, what few snowdrops and crocuses I had have been destroyed gradually by the squirrels over the years. ﻿﻿﻿﻿﻿﻿ ﻿﻿﻿﻿﻿﻿﻿I've seen witch hazels occasionally around the city but more often than not they are the fall-blooming common witch hazel Hamemelis virginiana. There are several groves of fall-blooming H. virginiana in the gardens near the front entrance of Allans Gardens Conservatory. Backlit, the flowers really glow a clean yellow and provide the only colour, flower-wise, at this time. They have a faint but sweet fragrance too, if you are curious. Visually, they appear to be "spiders" resting on branches, waiting to be reviewed up close. Sometimes I cut a few errant branches in late February or early March and put them in water. This process, called forcing, is also done with other shrubs like forsythia where the flowers "bloom" indoors. My only quibble with my witch hazel is that the leaves persist all winter. But this is so minor! I try to incorporate this shrub in my landscape designs due to its multi-season interest and pest resistance. Looking forward to seeing more gardening posts from your travels across Toronto. Welcome to garden blogging! I, too, have just started a gardening blog, and had actually thought about using the name "Garden Muse", but by the time I got around to starting, it had been snapped up. 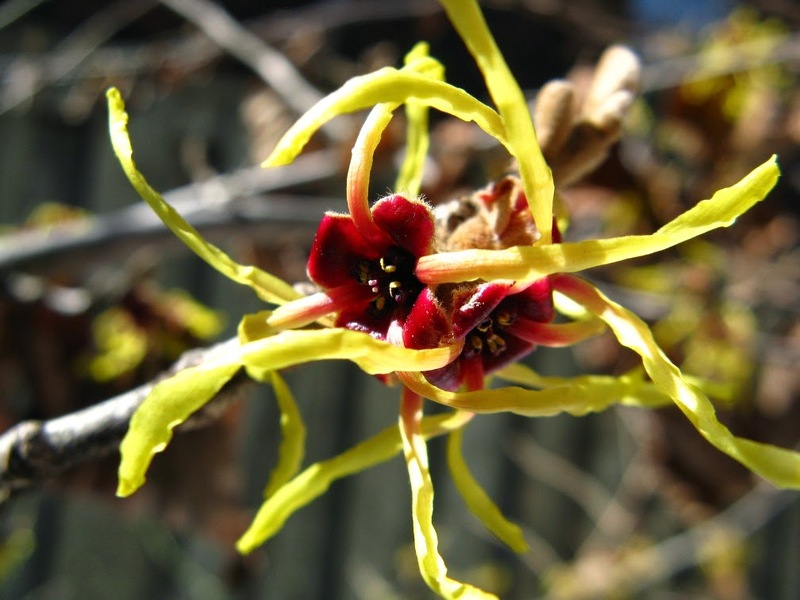 I love the witch hazel that you've got pictured....the scent is so delicate and fresh. All the best with your blog! I love witch hazel. I planted Arnold Promise 2 years ago, and last summer planted Magic Fire. Now I have the urge to collect more. Great to see another Toronto blogger on Blotanical, welcome. Lovely photo with the natural lighting. Looking forward to your blog! the sunlight just hit the shrub at the right angle, I ran for the camera and click! Wasn't planned! Thanks for dropping by.